I was commissioned by Chris B. from New York to make a design for the Mad Max franchise, and he was kind enough to let me share the designs here with you. Above is the primary ‘Road Warrior’ design (based on the second film) that takes after his Interceptor car and uniform. The jersey features an MFP police badge on the left shoulder, and the back neck patch is the hood-mounted motor from the car. Next up is a design based on the first film. As you can see Mel Gibson has a different outfit and cleaner appearance. He’s a very handsome man — why is he so grumpy? The logos on the left were the first attempt but I wasn’t 100% happy with them, so I started from scratch and arrived at what you see in the top two images. During this project I finally got around to watching the first two Mad Max films (saw Thunderdome when I was a kid), and the MFP police cars in the first film caught my eye so I made a jersey design based on them. I feel silly for not thinking of the Road Warriors as a potential team design earlier, but like I said the films weren’t exactly on my radar. However I am now interested in checking out the new reboot films (Fury Road and Furiosa). These could be made available one day, but I’d have to make Max look a little more generic, because the Mel Gibson likeness is too apparent. The yellow MFP jersey wouldn’t be a problem though. 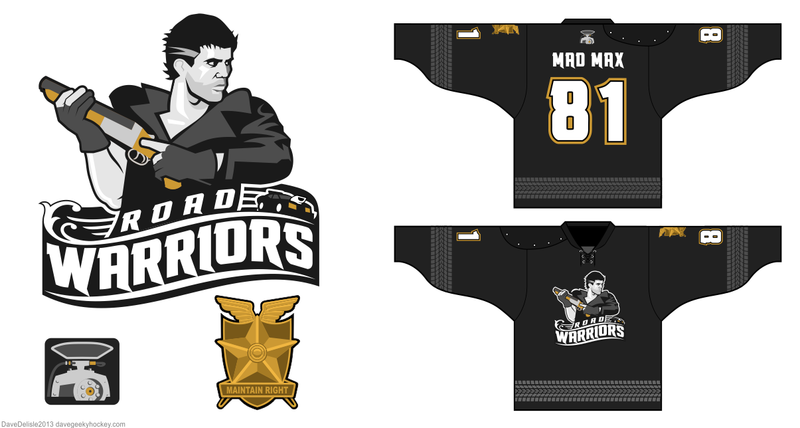 If your hockey team is looking for a new set of jerseys I can make a Home Warriors version of the logo for the home jersey. Ha. As usual, please like, tweet, or comment to show your interest. 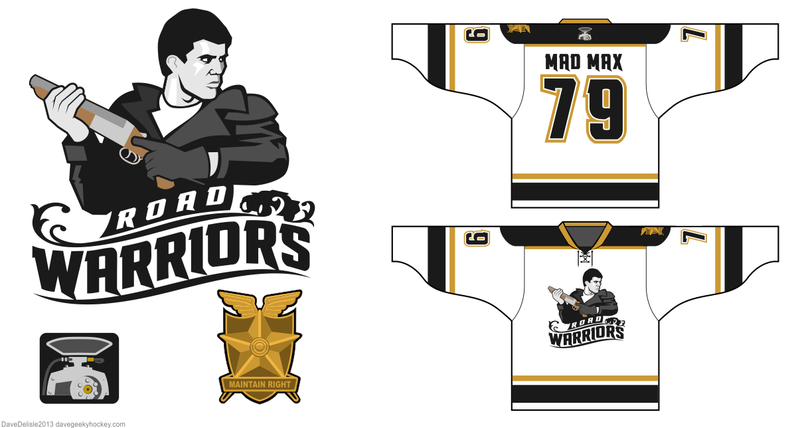 Posted on August 19, 2013, in Geeky Jerseys, Hockey Jersey Design and tagged Films, fury road, Geeky Hockey Jerseys, Hockey Jersey Design, Mad Max, mad max films, Mel Gibson, police badge, Road Warriors. Bookmark the permalink. 4 Comments. Big fan of the dark jersey. Maybe one way you can alter the logo is add an old style hockey mask. Keeps that hairdo people will recognize, but also takes out the facial features. This is a commissioned design. Alterations to art owned by a client will not be considered, sorry. Edit: oh right, if this goes to production. I’ll probably just make him look more like a generic Superman-type. I’d buy more than one! The yellow one is the best IMO. Original Interceptor style. Awesome. Are you ever going to do the blue and yellow interceptor jersey?